Like so many homes on the NSW Mid North Coast, you may not be using your 50 watt halogen downlights, due to high and rising electricity costs. The time is now though to take a look at recent new developments in LED lighting. A low wattage form of lighting, that costs little to run and is a direct replacement for your 50 watt halogen globes. Aussie Home Energy is now able to show you the latest form of LED downlights, helping you to see the different available shades of white LED light and brightness, within your home environment. 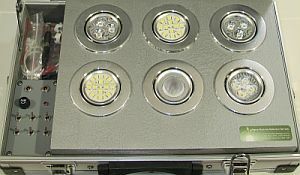 By using our LED Downlight Briefcase you'll be able to see how LED lighting can not only supply the equivalent light of a 50 watt halogen, but is also dimmable and generates minimum heat. LED lights can cost less than 5 - 20% of the cost of a 50 watt halogen downlight. Now is the time to re-use those light fittings, that are so much part of your homes decor. Our LED In-Home Service is offered to homes between Coffs Harbour and Sydney as part of our Home Electricity Audit Service. I found this website while I was looking for web sites related to Display Homes Perth and I came across yours. Anyway, the world of economical residential lighting continues to offer homeowners new choices. As energy costs fly off like a hot air balloon, new innovations like LED lighting for homes have come to the marketplace.